What company doesn’t want to get ahead in 2014? To help ensure employers are successful this year, Recruiter.com has created a new infographic as part of January’s Featured Series on “Innovative Staffing Practices.” “How Employers Can Stay Ahead,” shows how hiring employers are staying ahead of the game this year. 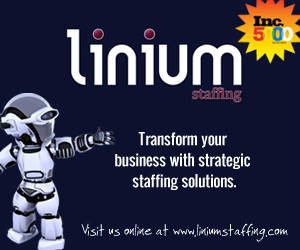 A big thank you also for this month’s Innovative Staffing Practices Leadership Sponsors, The Ladders and Linium Staffing. Please check our their innovative services! Are you ready to take the first step? Well, let’s go! To start, the infographic explains how employers must understand “The New Work Culture.” In today’s ever-changing work culture, flexibility is key with 73 percent of working professionals saying that flexibility is a deciding factor in their job search. Currently, there are 34 million employees in the U.S. alone who telecommute at times, meaning a large component of today’s work culture has the ability to conduct work outside the traditional office. This has led to an increase in alternative employment, as the infographic notes that 58 percent of employers said they plan to hire more part-time, temporary and contract workers over the next five years. As employers move along the path to staying ahead, they must also grasp today’s rotating workforce. A whopping 91 percent of millennials only plan to stay at a company for three years or less, while the U.S. Bureau of Labor reported that most employees only keep a position for an average of 4.4 years. But, if workers are changing jobs so quickly, just exactly where are they going to? The infographic points to the Internet, with online staffing company Elance reporting a 51 percent increase in businesses contracting work virtually in 2013. And nearly half (48%) of Elance users said they freelance full time. Knowing the most profitable fields for jobs will also help companies stay ahead of the competition. The infographic notes that six areas—healthcare, business services, construction, retail, manufacturing, and hospitality—account for 66 percent of today’s workforce. And to finish, employers can look to see what other successful companies are doing to stay ahead this year. Offering flexible schedules, updating office technology, increasing contingent labor and using virtual meeting tools are just a few of the ways to ensure your business stays ahead.